Our Oyster Ridge cuvée honors an outcropping in our estate Margarita Vineyard that never fails to astonish. Here, large white oyster fossils are literally spilling out of the ground, fostering the type of calcium-rich soil that is coveted by winemakers worldwide. Each year, this cuvée comes from superior sections of the vineyard that are fastidiously farmed to maximize the fruit’s potential and meet the standards of the Oyster Ridge program. The final blend is assembled from only those barrels that exhibit exemplary complexity, structure and aging potential, often resulting in an unconventional union of varietals. We are proud to share that this vintage is ringing the bells of top wine critics, as noted below. We invite you to experience this remarkable wine at our tasting room, and you may also order right here on our web site. After a dry start to the new year, the floodgates finally opened at our estate Margarita Vineyard last week. Indeed, a series of storms rumbled through the Central Coast this month, capped by a three-day period during which we recorded more than three inches of rain at Santa Margarita Ranch. The bright greening of the hills is a welcome sight after drought conditions persisted in January and February. "There are no detrimental effects from heavy rain this time of year," says Winemaker Stewart Cameron. "It's all upside. It's putting a lot of moisture in the soil that will carry well into the growing season." This was also another instance of our ranch being a “rain magnet.” Indeed, there are spots on the ranch that average more than 30 inches of rain annually—far more than nearby San Luis Obispo and Paso Robles. This is a phenomenon related to the surrounding mountain peaks for which our winery is named. As moisture-laden air blows in from the ocean and travels upward along these mountain slopes, it cools and condenses, forming clouds and generating elevated precipitation. The added soil moisture from the rain allows our vines to thrive through a long growing season, which in turn allows us to produce wines with ripeness, structure and balance. While we are still below historic rainfall averages this year, this wet March made a big difference and will help stave off the return of drought conditions. 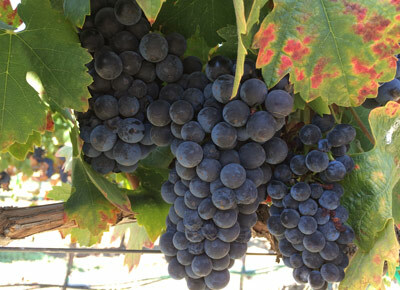 This wine comes from our estate Margarita Vineyard, where the Zinfandel fruit (pictured here) achieves a signature balance of both ripenesss and structure. Meanwhile, our 2016 Sauvignon Blanc recently notched 91 points with an “Editor’s Choice” designation in Wine Enthusiast, as well as 92 points in Tasting Panel Magazine. The 2014 Oyster Ridge included in your last shipment was awarded a Double Gold medal and earned the distinction of Class Champion at the prestigious 2018 Rodeo Uncorked! International Wine Competition in Houston, Texas. It also scored 90 points in California Grapevine, and 92 points in Robert Parker’s The Wine Advocate. And the 2015 Renegade earned 93 points and an “Editor’s Choice” designation in Wine Enthusiast, along with 93 points from Tasting Panel Magazine. We invite you to come to our Paso Robles tasting room to try these acclaimed wines, and to also enjoy a bit at our adjoining cafe. Our winemakers recently stepped up to answer an age-old philosophical question: "Blending wines – is it art, science or a little of both?" Indeed, Director of Winemaking Mike Sinor and Winemaker Stewart Cameron fielded this question as part of the new "Ask The Expert" series on the popular Reverse Wine Snob site. So what's their answer? "A lot of both." They continue: "To be good at blending wines, you have to know your science. But to be great, you need to bring some artistry to the task. Let’s start with the science – the chemistry of the wine. Much of this is handled at harvest time, by growing, fermenting and then aging wines that are technically sound. Your tannins, acids, pH and alcohols are established early in the life of a wine, so that is your time to get it right. You want to avoid scientific flaws, rather than try to fix or blend them away later. However, science can only take you so far. If you are driven to achieve something great – a blend that will stand the test of time – then you need to delve into the art and mysticism of wine. You need to push and challenge yourself as a winemaker, to taste the wines of the world as your point of reference, then create something that is truly your own." Click here to read the rest of the story on Reverse Wine Snob. We are excited to share that our 2015 Zinfandel earned a gold medal and "Best in Class" at the prestigious 2018 San Francisco Chronicle Wine Competition. Our 2016 Chardonnay nabbed a gold medal as well. This year’s San Francisco Chronicle Wine Competition received 6,960 entries, and was judged by an all-star cast of wine authorities. Our good news doesn't end there. The 2016 Sauvignon Blanc recently notched 91 points with an “Editor’s Choice” designation in Wine Enthusiast. Meanwhile, the 2015 Renegade earned 93 points and an “Editor’s Choice” designation in Wine Enthusiast, along with 93 points from Tasting Panel Magazine. And our 2014 Oyster Ridge earned 92 points in Robert Parker’s The Wine Advocate, and was awarded a Double Gold medal with the distinction of Class Champion at the 2018 Rodeo Uncorked! International Wine Competition in Houston, Texas. We invite you to come to our Paso Robles tasting room to experience these award-winning vintages. Okay, it’s not quite a full-length movie, but it covers a lot of ground! Indeed, we are excited to share our new three-minute winery video titled “The Ancient Peaks Winery Experience." Shot by the talented Cameron Ingalls, this video shows how our three longtime local winegrowing and ranching families have built Ancient Peaks upon a legacy of history, hospitality and family. We hope you enjoy watching this latest chapter in the Ancient Peaks story. We invite you to join us for the “Taste of Paso Robles” grand tasting on January 10, which will showcase 25 leading local wineries in an intimate setting overlooking Atascadero Lake. Local chefs will present wine friendly small plates and winemakers will showcase some of their finest reserve and library bottlings. During the grand tasting, you will enjoy rubbing shoulders with these wine industry luminaries from near and far. Don’t miss this unique opportunity to taste the best of Paso Robles and make new friends in the world of wine. For tickets and information, please visit www.winespeakpaso.com. Wine Speak Paso Robles is a premiere educational summit for sommeliers, wine industry leaders and hospitality professionals. It includes winemaker seminars, sommelier-led tastings, technical tours and more. Featured master sommeliers will include Fred Dame, vice president of prestige accounts at American Wine & Spirits and chairman of the board of GuildSomm; Nunzio Alioto, former chairman of the Court of Master Sommeliers; and Greg Harrington, founder and winemaker at Gramercy Cellars. Featured winemakers will represent numerous regions, including Walla Walla, Napa Valley, West Sonoma Coast, Santa Maria Valley, Santa Ynez Valley, Paso Robles and Victoria, Australia.